The concert is busiest on weekends and booking mid-week helps avoid the crowds. We are comparing Vienna Mozart Concert at the Golden Hall Prices from leading ticket suppliers and Try to find you Cheap tickets prices on the market. The Vienna Mozart Orchestra was founded in 1986 and is today made up of 30 famous musicians. The orchestra consists of members from the Vienna Philharmonic Orchestra and the Vienna Symphonic Orchestra. The Golden Hall/ Musikverein is the permenant seat of the Vienna Philharmonics and the main stage of the Vienna Mozart Orchestra. This prestigious Austrian ensemble has a long standing concert practice and is considered one of the most experience Mozart interpreters across Europe. The talented musicians dress in Baroque costumes and wigs to offer an authentic period performance. The Golden Hall is known world wide for airing the annual New Year's Eve concert which is broadcast worldwide annually. Expect to enjoy fantastic renditions of pieces by the Strauss Dynasty including "The Blue Danube Waltz" and "The Radetzky March". Culture vultures and music lovers alike will delight at this evening Mozart performance. Your Experience With Vienna Mozart Concert at the Golden Hall? 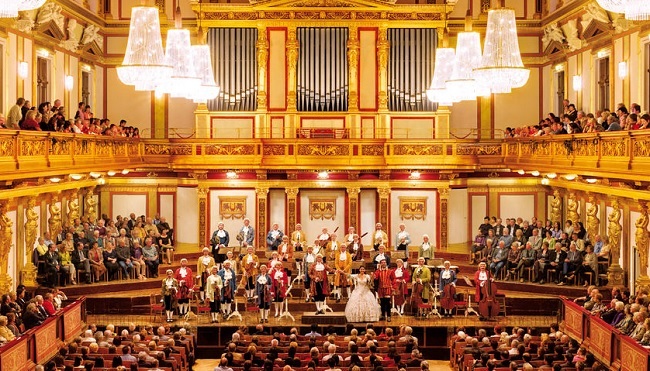 Enjoy an evening with the Vienna Mozart Orchestra at one of Vienna's finest music halls. Have a night to remember at the Wiener Musikverein Concert Hall (also known as the Golden Hall), one of the finest concert halls in Europe thanks to its highly regarded acoustics. You'll be transported back in time on a musical journey, to the late 18th century, as the musicians take to the stage in Baroque costumes and wigs. Sit back and listen to the international opera singers perform overtures and duets as they recreate some of Mozart's most famous operas. What Vienna Mozart Concert at the Golden Hall Includes? Anniversary CD of the Vienna Mozart Orchestra. Book your tickets in advance to avoid disappointment. Travelers Reviews about Vienna Mozart Concert at the Golden Hall? The Vienna Mozart Concert at the Golden Hall is rated 4.5 stars on Tripadvisor with many customers saying the concert hall was magnificent and provided an "excellent acoustic experience". The Wiener Musikverein Concert Hall is accessible for wheelchair users but please advise your tour provider in advance. Bookings through Get Your Guide can be cancelled with a full refund 24 hours in advance. There's a strict formal dress code of black tie. Children and students can enjoy ticket discounts. Golden Hall, Wiener Musikverein, Bosendorferstrabe 12, Vienna.